The maestro Zubin Mehta was worried. There was a distinct edge of panic in his voice as he paced his beautiful Los Angeles home trying to work out a solution to a horrendous problem. With five hours to go before their debut performance at Walt Disney Concert Hall, the Vienna Philharmonic’s instruments had still not arrived. For one of the world’s finest orchestras, whose sound is so distinct, it could have been a disaster. They were due to perform Bruckner for a sophisticated and knowledgeable Angeleno audience, and the two concerts had been sold out for weeks. Although the LA Philharmonic had offered to lend them instruments, their conductor knew it simply wouldn’t be the same, such is the perfection of the blending of their own instruments. Although the musicians had arrived safely in LA two days earlier, after four barnstorming performances in Carnegie Hall, the instruments had been placed on a later flight that was delayed because of a snowstorm. The New York and LA performances were part of the Vienna Philharmonic’s four-week world tour, which culminates in Abu Dhabi tomorrow and Saturday. Conducted by Mehta, they will perform Franz Schubert’s Symphony No 9 and a selection of waltzes, marches and polkas by Johann Strauss at the Al Jahili Fort in Al Ain tomorrow. On Saturday, they will play Wagner and Chopin with the celebrated Chinese pianist Lang Lang at the Emirates Palace Auditorium. In the end, all was well. With barely one hour to spare, the plane landed in LA and the instruments were whisked to the concert hall. The performance was an unqualified success, with the Los Angeles Times enthusing about the way the orchestra made Bruckner “glow with a special radiance”. Mehta’s relief was palpable. He told the audience that he had been dreaming of playing with the Vienna Philharmonic there since 1962. Mehta, one of the world’s most flamboyant and illustrious conductors, has made the City of Angels his home – or at least one of them – since 1992. He is, however, one of that elite group of people who can truly describe themselves as “citizens of the world”. He speaks seven languages fluently, including English, German and his native Gujarati. Born in India, Mehta is fiercely proud of his heritage and still travels on an Indian passport despite the hours of irritating form-filling that is necessary to get visas. 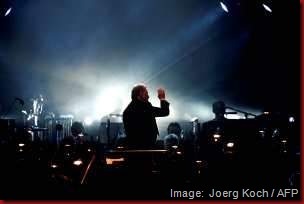 During a peripatetic career as a conductor, Mehta has put down roots in Vienna, Florence and Los Angeles, where he has been the honorary conductor of the Los Angeles Philharmonic since 2004. Last week, he entertained the entire orchestra at a barbecue in the gardens of his magnificent home on the edge of the Los Angeles National Forest, with a view of the San Gabriel Mountains, importing several chefs to cook. He and his second wife, the former American film and television actress Nancy Kovack, to whom he has been married for nearly 40 years, also own a charming Tuscan farmhouse in a forest near Florence. His first marriage to the Canadian soprano Carmen Lasky ended in 1964 after six years. “Home is many places. Principally, my hometown is Bombay but I live in Los Angeles and I also think of Vienna, where I went when I was 18, as home,” he said. “We had 130 people in the garden this week, the whole orchestra and their wives and guests. It was a wonderful day. We ate barbecue and cheesecake. I didn’t cook myself, although I do like to cook and my wife is an excellent cook.” He admitted that he still carries a small bag of fresh chillies wherever he goes to liven up what can sometimes be bland American food. He was born into a Parsee family, to Mehli and Tehmina Mehta, in what was then called Bombay. His father was a violinist who founded the Bombay Symphony Orchestra, and Zubin grew up surrounded by music and musicians. He could often be found standing on orange boxes conducting imaginary orchestras. “I am a Parsee, which is a minority of only 80,000 in a country of 1.2 billion. I grew up in a home filled with music. I can’t remember when I was first aware of music. It was always in our home,” he said. Although he briefly considered becoming a doctor and did two terms of premedical studies, music was his true passion. He left Mumbai to study at the Vienna Academy under the eminent teacher Hans Swarowsky. Contemporaries included Claudio Abbado and Daniel Barenboim. He still remembers the thrill of hearing the Vienna Philharmonic for the first time, and he has tried to recreate it in the orchestras with which he has been associated: the Los Angeles Philharmonic, the Israel Philharmonic and, of course, the Vienna itself. Mehta describes the sound as a sort of “organised untidiness” that Viennese musicians imbibe from their infancy. He made his debut as a conductor in 1958 in Vienna, where he was soon noticed for his flamboyant and forceful style. In the same year, he won the International Conducting Competition in Liverpool and was appointed assistant conductor of the Royal Liverpool Philharmonic Orchestra. Two years later, he became the music director of the Montreal Symphony Orchestra, a post he held until 1967, and in 1961 he was also named assistant conductor of the Los Angeles Philharmonic, an appointment that caused a ripple of controversy. The orchestra’s music director, Georg Solti, was not consulted and resigned in protest. Mehta became the orchestra’s music director, a place he retained until 1978. Mehta’s association with the Israel Philharmonic began when he was appointed as its musical adviser in 1969. He was appointed music director in 1977 and was honoured with the title for life in 1981. He was the music director and principal conductor of the New York Philharmonic from 1978 until he resigned in 1991, and since 1985 he has been chief conductor of the Teatro del Maggio Musicale Fiorentino in Florence, where he is an honorary citizen. He was also music director of the Bavarian State Opera in Munich and an honorary conductor of the city’s Philharmonic Orchestra. He is the recipient of most of the musical honours the world has to bestow. Till Janczukovicz, the artistic director of the Abu Dhabi Classics, invited Mehta to be conductor in residence of the current series. Handsome, charismatic, and with a huge onstage presence, Mehta has rock star status and an enormous and devoted following in the world of classical music. He has always a stylish dresser, and as a young man he sported a thick shock of dark hair and long sideburns. The hair is now grey and the sideburns gone. Over the past year or so he has been careful about eating and has lost several stones in weight. His small vanity is the personalised number plate M8A (it needs to be said out loud) on his Audi. Musically, however, Mehta has never been afraid to take risks and experiment. He once made a recording with the Indian sitar player and composer Ravi Shankar and the London Philharmonic Orchestra. He was also the chosen conductor for the fabled Three Tenors’ first-ever concert in Rome in 1990. The performance by his old friend Placido Domingo, the late Luciano Pavarotti and José Careras spawned a rash of copycat acts as classical music crossed over into popular culture. He has directed many of the world’s most celebrated musicians, and his recordings are deemed by aficionados to be among the finest ever made. In June 1994, in a fund-raising concert for the victims of armed conflict and in memory of the thousands killed in the Yugoslav wars, he conducted the Sarajevo Symphony Orchestra and Chorus’s performance of Mozart’s Requiem near the ruins of Sarajevo’s National Library. Another notable concert that attracted worldwide coverage was one near Buchenwald, the former concentration camp in Weimar, German, with the Bavarian State and the Israel Philharmonic orchestras. Three years ago, on the first anniversary of the devastating tsunami, he gave a concert in Chennai with the Bavarian State Orchestra. Mehta feels compelled to use his celebrity wherever he can to raise funds and focus attention where it is needed. As he explained in an interview in the Abu Dhabi Classics magazine: “My parents were always very proud and contented people. They taught me that from time to time we must use our talents, our art, to bring together people who do not live together in peace. One must become involved in one’s situation, with one’s surroundings. Mehta will give a total of four performances as part of the Abu Dhabi Classics. After the first two this week, he will return in April with the Orchestra del Maggio Musicale Florentino for a performance of The Resurrection Symphony by Gustav Mahler followed by a programme of Russian Landscapes featuring the music of Mussorgsky and Tchaikovsky.